GET LOST IN THE SANHEIM CHRONICLES! A Celtic legend and "The Legend of Sleepy Hollow" collide in The Sanheim Chronicles, a trilogy that deftly combines urban fantasy, mystery, and suspense. Quinn O'Brion and Kate Tassel, two community journalists, tapped into a dark power last Halloween in order to stop a vicious serial killer. But they are still grappling with their new abilities--and wondering if what they unleashed may soon consume them. While they confront what they have become, a new threat is hunting them--a force that could destroy their whole town. 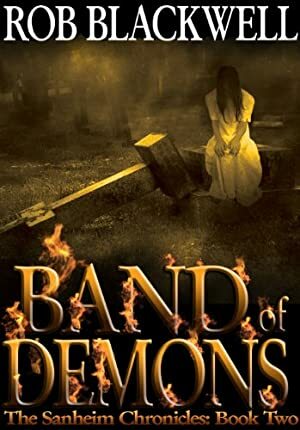 Band of Demons continues the epic story of The Sanheim Chronicles, a trilogy that blends mystery, suspense and urban fantasy. Track It. This book has been $0.99 within the past year. Log In to track Rob Blackwell on eReaderIQ. to be notified each time the price drops on any book by Rob Blackwell. to stop tracking Rob Blackwell. We started tracking this book on October 5, 2012. This book was $3.99 when we started tracking it. The price of this book has changed 18 times in the past 2,389 days. The current price of this book is $3.99 last checked 16 hours ago. This lowest price this book has been offered at in the past year is $0.99. The lowest price to date was $0.99 last reached on October 29, 2018. This book has been $0.99 5 times since we started tracking it. The highest price to date was $3.99 last reached on November 5, 2018. This book has been $3.99 10 times since we started tracking it. We last verified the price of this book about 16 hours ago. At that time, the price was $3.99. This price is subject to change. The price displayed on the Amazon.com website at the time of purchase is the price you will pay for this book. Please confirm the price before making any purchases.